Read for the full 24 hours. 10 completed books totalling 1801 pages. PLUS two still in progress (203 pages for one and about two hours of audiobook for the other). I read for 12 hours and 17 minutes. My goal was 12 hours so at least I made it. I would have done more if I hadn’t gotten sick. Three small books and some of another, a number of articles because my head was killing my and I needed a break from books, and some daily Bible reading. I don’t know my page number because I had already started one book and I don’t know if the articles count. I’m sorry if you say the articles shouldn’t count toward hours. I felt like they did because its still reading that is beneficial. Thanks so much for everything this weekend! You guys were great. Everything was great, I’d just maybe have an intro/closing questionnaire or something that gives people incentive to check out each other’s blogs (if they have them) and reach out. That’s all I can think of, though! I have read 2 books, 603 pages, for only 13 hours during this readathon. Despite not meeting the goal I really enjoyed this first readathon I ever participated. It’s been a long time since I read this much in one go. I totally agree about the intro/closing questionnaire. It’s always fun to answer those questionnaire and read other participants’ entries after the readathon. Looking forward for the next readathons! Thanks so much for hosting Rachel – great job guys! I made it to 24 hours! I’ve never been so successful with a readathon, this was amazing! I just squeaked in, finishing last night at about 10:30 with almost exactly 24 hours. I read just under 1300 pages, finishing Slow Food by Carlo Petrini, Eat More Better by Dan Pashman, The Sharper Your Knife, the Less You Cry by Kathleen Flinn, All New Square Foot Gardening by Mel Bartholomew, and The Art of Baking Blind by Sarah Vaughan. I also finished the audio of The Particular Sadness of Lemon Cake by Aimee Bender, which was just under 9 hours long. Thanks for putting this on, I really enjoyed myself this weekend. Read for the full 24 hours. 9 books, 2,586 pages total. Unlimited fun. Me?! Yay! I’m so excited! I really wanted some of those books. I read for 14.75 hours. 905 pages. 4 books finished and three more started. My dog chose Saturday night to sleep right in the middle of my sleeping spot, leaving no room for me. I kept thinking he would leave, but he never did. When I tried to shove him over, he rolled over back into my spot. So I didn’t get much sleep, but I still did better than I did on my last readathon. So it’s a win! Thanks for hosting. I really enjoyed it. Well, I’m glad to know I can do the whole 24 hours, but I think next time I will make a smaller goal. But I had lots of fun. Thanks for hosting the readathon. I will most certainly be returning. I managed 13 hours for 550 pages including an hour of audiobook listening! This is the first time I have participated in a read-a-thon and while I had other things going on this weekend, it was a great escape for a few hours! Thank you for hosting and I am already looking forward to the next one! I had work pop up going into the weekend, so I only managed to read for about 11 and a half hours. But in that time I finished two books, started a third, and also listened to a chunk of an audio book, so I still feel accomplished. And it’s just so much fun to read and know that there are so many people out there reading and checking in and sharing their progress as the same time. Looking forward to the ned 24 in 48! I only managed to get in about 6 hours 😦 But I did finish 2 books. Hopefully the next readathon is more successful for me. Thanks for hosting! Thanks for hosting! 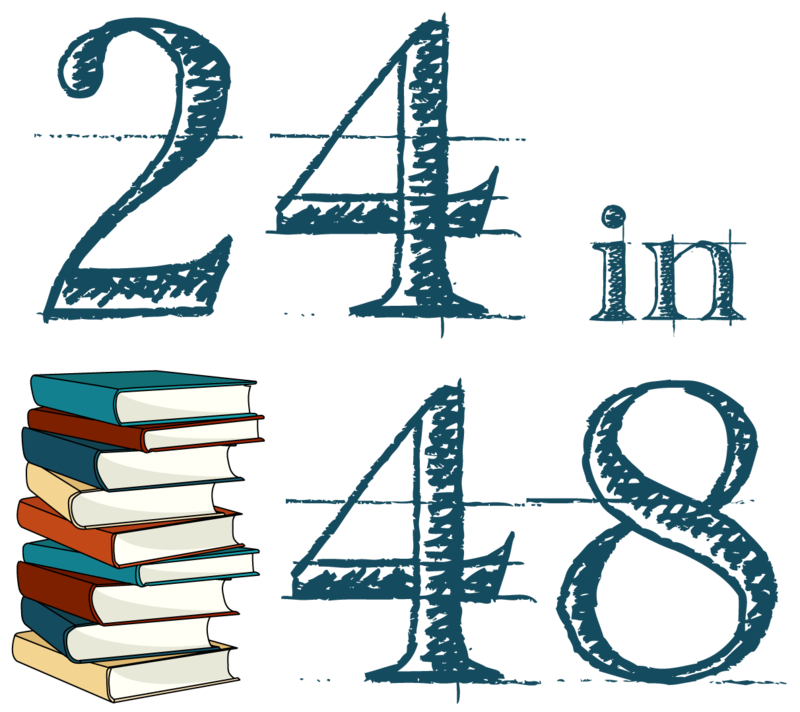 It was my first #24in48, and I LOVED it! I had a big family wedding so I didn’t hit 24 hours, but I did get a good solid 11 hours in. I completed 1 entire book, finished 2 others, and started 1 more. I’m pretty happy with those results! Looking forward to the next adventure! I am pretty sure my hours read where around 17ish. I lost track! Ooops! I read 2 novels, 1 audiobook, half of another, and 1 Trade Paperback. It was super fun and looking forward to doing it again!!! I’m posting way late but I loved this challenge, can’t wait to do another!